The perfect Mini-moon destination is right here in central Virginia! Directly in the middle of Charlottesville and Lynchburg, Nelson County and the Orchard House Bed & Breakfast provide an easy and memorable escape for the new bride and groom. We have loved hosting several Bachelorette Party weekends on our 14 acre property this summer, and are now enjoying the newest trend: our former-bachelorettes returning with their new husbands to share the fun and adventures! 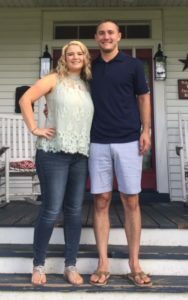 Our bachelorettes have raved about Nelson County and the Orchard House experience. They have been participants in our multi-stop wine tours, hiked beautiful Crabtree Falls, eaten in the downtown Charlottesville Mall, conquered the Nelson 151 Brew Trail, and soaked up our own salt-water pool and fire-pit. What could be more fun than returning to share all of that as newlyweds??? We were so honored when one of our newest brides made a return reservation for a long weekend. She requested the Wine Tours, wanted to sit on our front porch gazing out at “our” mountains, wanted to soak up some pool time, and end each day sitting by the fire pit sipping drinks and listening to the chorus of pond frogs. 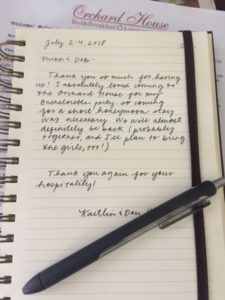 Her new husband was so impressed with our bed and breakfast and the area, they are already talking about their next trip here! Our bachelorettes already know how much there is to do in Nelson County. One weekend visit just barely taps the surface. What a perfect reason to return and make more memories here! We’d love to help you plan and host the perfect mini-moon, bachelorette party, anniversary weekend, or just a “we need a break” getaway. We are confident you will love it here at @orchardhousebed so much, you’ll be mentally planning your next visit before you even leave! Sounds like a wonderful place to visit from your Guest Reviews and the pictures are fantastic. I was so excited to see this! We loved staying there and have told all of our friends about it! We absolutely loved having you back! Thanks for spreading the word about our little slice of heaven, and please come back again soon! !